What is HIPEC and how does it work? 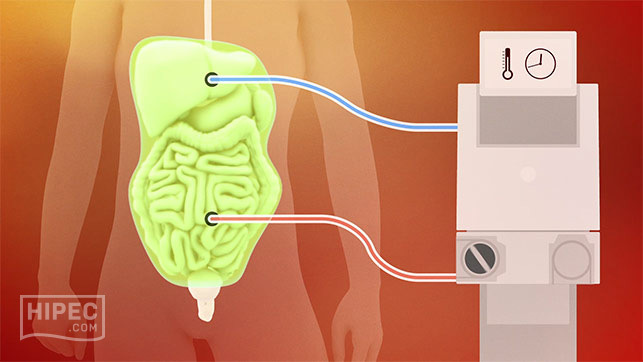 The HIPEC treatment strives to radically remove all cancer cells from the abdominal cavity by combining surgery with heated chemotherapy in the abdominal cavity. The goal of this treatment is to promote long-term survival or even to cure the patient. The operation is performed under general anesthesia and typically lasts for 6 to 9 hours. However, lengthier procedures may be required. The HIPEC-treatment is now considered standard of care in many countries for select patients with mesothelioma, pseudomyxoma peritonei and patients with peritoneal cancer from a colorectal tumor. Some hospitals also offer HIPEC treatment for other indications, such as peritoneal cancer from gastric or ovarian cancer. Since HIPEC is a complex and invasive procedure, postoperative complications occur frequently. Relatively frequent complications include an infection of the lungs or urinary bladder, wound problems and the inability to eat or drink during several days or even weeks. Although the HIPEC procedure is performed with the intent to cure a patient, it should be realized that peritoneal cancer is an aggressive disease, which often recurs even after a successful HIPEC-procedure. To further improve outcomes after HIPEC, the treating physician may advise additional systemic chemotherapy. Treatment of peritoneal cancer patients, and in particular treatment with HIPEC, is complex and requires a dedicated, experienced multi-disciplinary team. Treatment for peritoneal cancer should be offered only at institutions with sufficient knowledge and skills to achieve optimal surgical results as well as safe administration of intraperitoneal chemotherapy. These treatments are typically performed in dedicated hospitals with vast experience in the treatment of abdominal cancer. There is no worldwide-recognized quality assurance or certification for HIPEC centers, so patients should research the reputation of a HIPEC center very carefully before they seek treatment.